The North American Coastal Plain – the low-lying land stretching from Texas to Florida to New England – was recently named the 36th biodiversity hotspot in the world, highlighting the importance of this region, but signaling concerns over threats to the plant and animal life there. To be recognized as a global biodiversity hotspot, a region must contain at least 1,500 endemic plant species found nowhere else in the world and have experienced more than 70 percent habitat loss. The Coastal Plain has 1,816 endemic plants and has suffered an 85.5 percent loss of natural habitat. The loss of habitat shows no sign of slowing, according to several studies. Florida is entirely within the Coastal Plain and is the richest area biologically, but also the most threatened. “We are suffering the highest rate of habitat loss because we have the highest rate of human population growth within the region,” said Reed Noss, a University of Central Florida biology professor who was the lead author of a scientific study that landed Florida and the rest of the North American Coastal Plain on the list. “Florida, in term of endemic species, is the hottest spot within the Coastal Plain,” Noss said. Among the one-of-a-kind species in danger are species of turtles, frogs, freshwater fish, mice, birds and many types of plants and invertebrates. Noss, who has been studying biodiversity conservation for more than 40 years said it is critical to protect the hotspots within the hotspot that have the highest biological values. Also important is to manage growth and stop urban sprawl, he said. Noss directs the SPICE (Science and Planning in Conservation Ecology) Lab at the University of Central Florida. His research group is diverse, with ongoing projects including avian conservation, studies of the impacts of road and animal crossings, fire ecology, large carnivore conservation, and the effects of sea-level rise and climate change on Florida’s biodiversity. 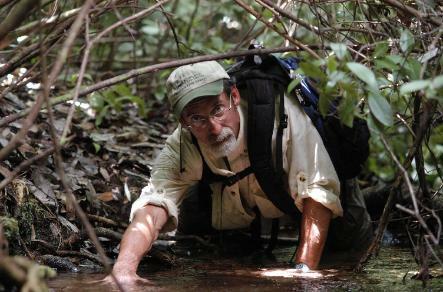 Noss is also president of the Florida Institute for Conservation Science and has directed ecological and conservation studies in Florida, throughout the Southeastern United States, Pacific Northwest, Rocky Mountains and Canada. Critical Ecosystem Partnership Fund is a joint initiative of l’Agence Française de Développement, Conservation International, the European Union, the Global Environment Facility, Japan, the MacArthur Foundation and the World Bank. To read more about the hotspot list click here.